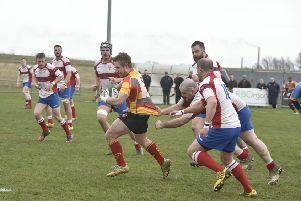 The injury-ravaged city side went down 68-35 to Tynedale at Solstice Park. The Lions wanted to put on a spectacular show for their loyal fans and succeeded, although not entirely as they would have hoped. Tom Gulland in action for Peterborough Lions against Tynedale. Photo: mick@picturethisphotography.co. But there were mitigating circumstances. Tynedale were also missing regular players, but they managed to raid the Academy of their local Englis Premiership club Newcastle Falcons and bring several gifted young players to the game, including the son of former England star Dean Richards. “We were struggling for a side as late as THursday,” Lions chief Andy Moore admitted. “But we also heard Tynedale were struggling so we though we might be okay. Tynedale were a different class before the break which they reached 49-0 ahead, but Lions won the second-half thanks to tries from Nico Defoe (2), Tom Gulland, Christian Edbrooke and Alan Carr. The visitors eventually ran in 10 tries. The Lions have won four and lost 24 matches in a chastening campaign. They will ship over 1,000 points if they concede 14 in their final fixture at Wharfdale on April 27. The city side are 14 points adrift at the foot of the table which is a fair reflection of their struggles in a first season as a National League club.